I'm so excited because today is my last day in the office before Christmas and before all the craziness of the holiday sets in. Since we got married on a beach in Aruba 2 and a half years ago, Shaun and I have had to make up some new strategies for how we spend the holiday. So today I'm sharing it with you! We are lucky that our parents live very close to each other, so the extravaganza usually goes off without a hitch! We're approaching my favorite day of the year...Christmas Eve! Yes, I love Christmas Day, but Christmas Eve has always been 'the big night' in the Cannon Family, which works out nicely since the Humiston side has a big celebration on Christmas Day. Not only is Christmas Eve the one holiday that my mom hosts her family, taking over after her mother - Grandma Mary - passed away, but it also marks Grandma Mary's birthday. Since there's 2 days to play with at Christmas time, Shaun and I have the festivites pretty much down to a science. It all starts early on Christmas Eve morning. When my sisters and I were young children, Dad started the tradition of taking us out for breakfast and to the mall for any last minute shopping while Mom got the house ready for the big night. Now that we're grown, Mom joins us for breakfast. We go to a local spot and it's nothing fancy, but it's a tradition that I love and look forward to so much since it kicks off the fun and always brings back a flood of memories from Christmases past. I love that it's something my dad started. 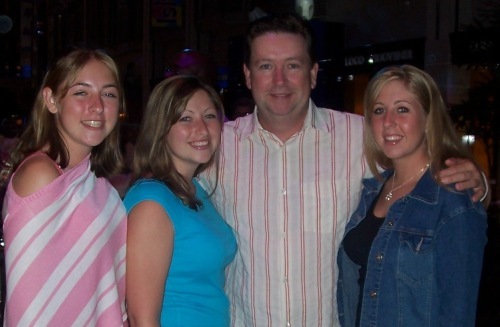 Dad, Christine, Kimberly and me many years ago! After dinner, Shaun heads to church with his dad and brother for a beautiful midnight mass. If we are all done at my parents house, I join him. Since we stay at my parents house on Christmas Eve night, he heads back to the house and the two of us exchange our Christmas gifts. It's pretty late at this point! And one of my favorite things is watching Chloe search in her stocking for t-r-e-a-t-s while watching 24 hours of A Christmas Story in the background. Once we hurry up and get dressed and ready, we head over to Shaun's parents house for Christmas Day. It's another fun-filled day of family and food! Shaun's aunts, uncles and cousins all head on over and I love this day because there are little cousins running around! One thing that I am excited for when we become parents (down the line) is celebrating Christmas. Christmas with kids is just the best ever. Their excitement and innocence just makes the entire day! It's so fun to hang out with all of them on such a special day! (Sorry I don't have more photos to share! My sisters and Shaun don't have a choice but to be plastered all over the blog, but I haven't cleared photo issues with Shaun's family yet...perhaps a good topic to broach this Christmas ;))! After spending the day with the Humistons, we are tired. We are full. We trudge back to Jersey City and collapse from food-induced coma and lack of sleep. Meanwhile, I want to share one very funny photo of my sisters and me when we were kids, in front of the Christmas tree. Embarassing, right? I'm not sure what I'm doing (or wearing, for that matter) but I love this photo. It captures such a moment! Nothing like Christmas time in New York City! Throwback! Not sure of the exact date, but I think this was back in our college days! In fact, we have a big holiday date night planned for Thursday to kick it all off. I can't wait! So that's how we split our time during the Christmas season. It's busy, exhausting and fattening, but I wouldn't want it any other way.